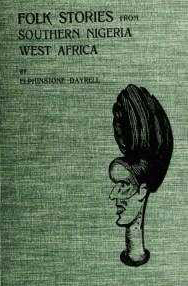 Cover of the ‘Folk Stories from Southern Nigeria’, 1910. Folk Stories from Southern Nigeria is a collection of 40 folk tales gathered for publication by Elphinstone Dayrell, District Commissioner of South Nigeria, and features an introduction by noted folklorist Andrew Lang. One of the most well-known stories in the collection, Why the Sun and Moon Live in the Sky, has been turned into an award-winning children’s book in 1995. Dayrell’s collection of tales came about after he heard many from the Efik-Ibibiopeoples of Southeastern Nigeria, a group of individuals that still exists today. He also authored a second collection of folklore, this one entitled Ikom Folk Stories from Southern Nigeria. It was published by the Royal Anthropological Institute of Great Britain and Ireland in 1913. In Ikom Folk Stories from Southern Nigeria, Dayrell notes that it was necessary to have at least one, if not two, translators on hand to collect the stories efficiently.